If physical therapy fails or if your pain is so severe that physical therapy is not an option, epidural steroid injections are the next line of treatment. Steroid injections are generally used for low back pain, neck pain, sciatica and disk bulge. Our pain management specialists will perform your injection at one of the local surgery centers. These are outpatient procedures and are done under “twilight anesthesia.” This means you are not awake for the injection, but do not require general anesthesia (breathing tube). The epidural injection procedure is usually painless; however, in 5-10% of patients there can be a flare reaction, which may increase your symptoms temporarily. 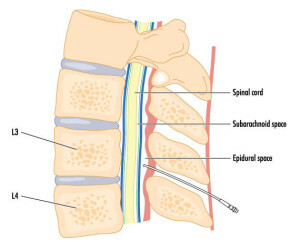 Epidural steroid injections are meant to reduce the inflammation that you have in your spinal canal. These can be done in the cervical (neck), thoracic (mid-back) or lumbar (low back) spine. After a complete evaluation, your spinal specialist will recommend the appropriate type of injection.